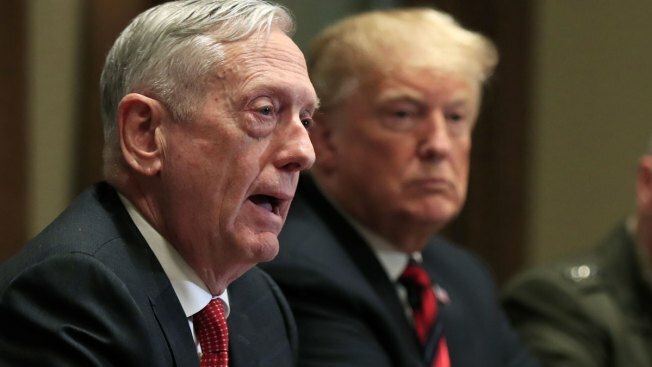 He told President Donald Trump he has "the right to have a Secretary of Defense whose views are better aligned with yours"
This Oct. 23, 2018, file photo shows Defense Secretary Jim Mattis (left) and President Donald Trump at a briefing with senior military leaders in the Cabinet Room at the White House in Washington. Defense Secretary Jim Mattis is resigning from the Trump administration at the end of February so President Donald Trump can have someone in the role with views on defense that are closey aligned with his own. Mattis told Trump he has "the right to have a Secretary of Defense whose views are better aligned with yours" on subjects like how to "advance an international order that is most conducive to our security, prosperity and values," as well as alliance building.